The Bruising Adventures of Girl Clumsy: Mmm, bacon. I must admit to always being somewhat amused by The Wah's constant fear of a zombie uprising, or zombiepocalypse if you will. It's rare he does not enter a residence or building new to him and immediately scope out a preferred hasty-exit route, or if one cannot be found, a preferred hole-up location - just in case the zombiepocalypse decides to strike while he's at a house-warming or popping into the bank. But perhaps I've been too quick to mock his paranoia. Perhaps the zombiepocalypse is coming sooner than expected. 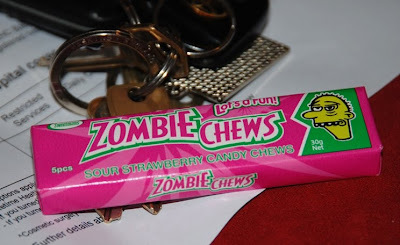 That's right - Zombie Chews. "Sour Strawberry" flavoured, as it happens. And the company that makes them? Sweetmans. Oh, the irony. For impending zombie infection-by-candy is NOT sweet. Not sweet at all. According to the garish pink packaging, Zombie Chews are a product of Turkey. What do our friends and old foes who bestride the Dardanelles know that we do not? As you can tell, I have not sampled the sour strawberry horror of the Zombie Chews. I fear any ill effect suffered post-consumption will lead to The Wah cleaving my head in with the salad tongs (being as how we lack a meat cleaver in this mostly-vegetarian household). But if this does mean the slow, rambling, brain-eating onset of the slow, rambling, brain-eating undead, then I shall begin preparing. And I will start by order a good seven-dozen cans of this fantastic product. In fact, I'm somewhat tempted to crack open a few cans of Tactical Canned Bacon well before the actual commencement of the zombiepocalypse. I mean, who doesn't want to eat 18 serves of preserved crispy bacon from a can? Even The Wah concedes once the undead hordes arrive, his vegetarian lifestyle is out the window. Perhaps I can tempt him with Tac Bac and eggs? Tac Bac with tomato & fusilli pasta? A Tac Bac double cheeseburger? Tactical Canned Bacon - a true weapon of mass DELICIOUSNESS. Look... I admit it: the likelihood of a Zed Attack is vanishingly small. But I'm delighted by the way nerdz and geekz all over the world are behaving in a Zed-conscious fashion. Because being prepared is never, ever stupid. My much-revered ju-jitsu instructor, Shihan Mark Haseman, taught me that awareness, observation and preparedness are ten thousand times more valuable than the ability to fight like Arnold Schwarzenegger channelling Bruce Lee. Don't laugh at him too much. Let him develop the habit and keep it. The day that the building catches fire, or a bomb goes off, or something similarly dangerous happens, you will be unbelievably grateful for all the bad zombie movies the boy ever watched -- and you will be alive to be grateful, standing outside that building, watching a whole bunch of other people get carried out by rescue crews. Apparently The Wah has resolved his paranoia to some extent. But I notice that Yoders Bacon in a can isn't 'tactical' so I will in future be ording my zombieapocolypse supplies from this excellent source. Don't knock the Wah's zombie prep, one day the brain he saves might be yours. To thank him you could take him out to see the new Woody Harelson Comedy 'Zombieland'.